let your computer do the hard work! This page is about fiNe-scaling a series of R-T-R tank wagons into a slightly better presentation of reality. 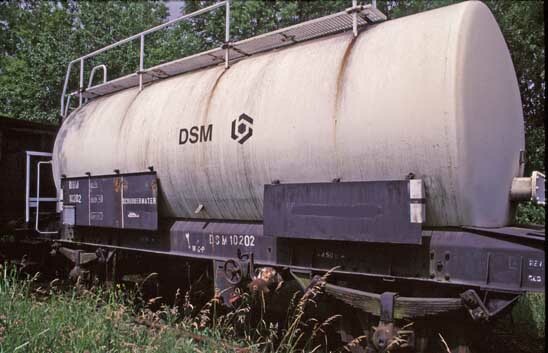 It all started out when I scanned some slides of a DSM tank wagon. These were taken at the ZLSM, a preservation railway in the south-eastern part of Holland near Maastricht. gulf wagon , shell wagon A similar DSM wagon happened to be in my collection together with 3 identical wagons with different livery, 2 of these are with private owner livery of the firm BON. The tank is fixed slightly different on to the base frame but that is not a striking nor annoying compromise. It is quite clear that rest of the upper parts this model leaves much to be desired, particularly the platform, laddering, walking frame and dome representation are pretty coarse and not conform reality. Other compromises are the over wide base, too short buffers and the blump of black plastic in between etc. In fact only the tank itself and printing should be preserved but lets start with the appendages as the first impression is determined by the top. We need these items anyway, even if we replace the frame in later stadium. The way to produce these items is obviously by etching as this will be the easiest approach. This is an ideal job for home-etching as contrary to outsourced professional jobs you don't have to fill an immense sheet full with drawings. The latter approach will doubtless earn you the title of the largest stockist of unbuilt kits. Non-etchers can possibly find some useful parts on the market which can be used for the buffer beams, platform and maybe a replacement ladder, but a closely fitting set can only come from a dedicated project. I used this project to built up practical experience in producing drawings for etching using the knowledge from Fremo club members as starting point. Peter Ehrenberg wrote a thorough explanation on etching in the german language that is linked through here. Thus I won't repeat the technical info on etching compounds that can be found in his booklet. In the past I etched many pcb boards and the equipment for this was still available stacked away in a dark corner, thus that formed part of the tools for this project. The other necessary component is a pc with printer and a design program based upon vector drawing and orthogonal coordinate system. I used Coreldraw 9 which is an object oriented program using layers. Other more CAD based software will do too, some even come free as spam guaranteed downloads on the internet. The etching process itself is very simple if we use a positive photo lacquered metal sheet. We produce a transparent film with black outlined components and use light to copy the components into the photolacquer. The lighted places become unprotected bare metal during developing. The bare metal is than etched away in a bath. To create different front and back on the etch we need two films that will precisely overlap with the highest precision that we are able to reach. These are taped together into a pocket that holds the sheet of base material. We thus need to light each side separately and develop these at the same time. Thus we first set out in producing a drawing using the computer. The whole drawing process followed is basically very simple. The new platform is based upon dimensions of similar platforms and these are published in books with drawings such as by Carstens. The ladder is based on dimensions from common sense helped by the above photographs with respect to other known dimensions such as the height of the platform barrier. This finally leads to a drawing of bits and pieces in frontal view. It helps to keep track of all object items to group them together into higher ranking objects and to give these then meaningful names. For a simple job as this, layers are not an immediate necessity, but larger drawings will profit by keeping grouped objects such as a full coach side onto different layers. These are then arranged in a compact composition and drawn within a black rectangle. The area between the components is filled with black infills leaving a small gap around the circumference. The components are then connected with small bars to keep them attached to the base, non-attached components will end at the bottom of your etching bath. At last we add a set of simple crosses at either side to be able to line out the front and back film. We now have a single sided film and this is mirrored for the back side. We now have to differentiate between front and back of the sheet. Primarily this concerns things like folding lines which are only on a single side of the sheet. 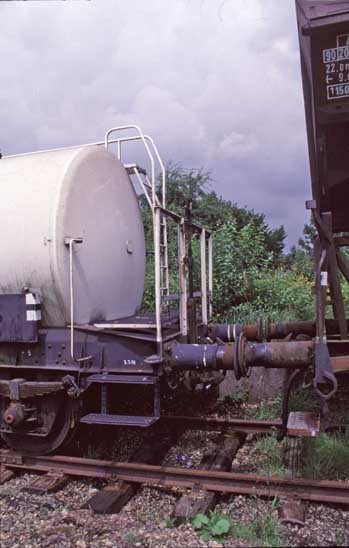 The steps and bases of the buffers are examples of objects with different top and bottom. The easiest way to do this is draw all these lines first time out but flip the color of the objects from black into white or other way around on the respective side. This can be done in the object properties menu toggling the fill and line color properties. The alternative is of course delete or add objects on the respective sides. In the end we finally arrive at a drawing that can be printed and after inspection etched. Unless you are a perfect worker you will find that you forgot some lines or that after etching some lines are a bit too fine or maybe too wide. Thus after a test etch some adjustments maybe necessary before arriving at a final design. As example in this case I made a split between platform and barrier as the folding of it was nice origami work but making it unnecessary complex. A sketch of the drawings developed for this item. This design is available as pdf-file under the Creative Commons Attribution-NonCommercial-ShareAlike License by clicking on the sketch. Next step in the realisation of this project is the transformation of the design on screen into a transparent film that can be used to transfer the drawing to brass or nickel silver sheet. The first step is using the printer. This is were the PDF file is most handy as it bypasses most common printer problems that may exist with various printer drivers. The current range of inkjet printers with photoprinting capability is perfectly suited for this job. The good old Linotype printer that was advised for professional printing of film 10 years ago had a resolution of 2400 dpi. The thing that sits next to me is an Epson C82 with 5750 dpi, this amazing resolution is available for less than 100 Euro nowadays. Even if we assume that 4 color dots sit besides each other then this leaves a resolution of better than 0.02mm, which more than suffices for the fine work we need to do. We will use overhead sheet for the transparent base. Now particularly the official printer brands don't come very cheap, I couldn't even find it in my area thus I didn't bother much and used cheap no-nonsense white label stuff. In principle a clear film with matte coating for ink adherence, please note that the coating dissolves in water. However the Epson printer does seem to have its drawbacks, it uses CMY colours to produce 'black' overheads. This turns out as a reddish transparent layer. Now we can fool the printer if we tell it that we feed it paper, then it uses black ink. However what happens then is that, if you look closely, is that when drying the ink breaks up into small islands leaving a crackling pattern. Even as this pattern is very small this turns out to be transferred very well onto the etch surface, besides it turns out that the scaling for paper is different as from transparency which is dead on scale. Thus what to do? That turns out easy enough, amazingly, put the sheet in a second time and the printer mechanism performs its trick again doing very accurately printing job, printing a copy exact on top of the first layer for a second time. Even the thinnest cross lines for lining out the sheets don't widen! (p.s. HP printers are not accurate enough to do this, but fortunately these can print black ink on overhead!). However I found it better that ample drying time for the first layer gives better results, reducing the chance on sticky or cracking inklayers. Half an hour in the sun will give a perfect sheet. Printing twice with the Epson leaves us with a sheet that is still reddish but dark enough for our purpose. Having the transparent film we cut the printouts into 2 parts that are taped back to back with sellotape using the crosses to line them out. This is best done with backlighting the film. Keep ready made pieces of tape under reach before you have a go. We fold the printed side inwards of course to minimise the widening effect that the sheet thickness itself may cause with divergent light sources. Recently I ordered pre-coated NS-sheet in Germany that comes with black plastic protective sheet. But for this job I just coated K&S 0.12 mm brass with a spray can positive lacquer from the electronics shop. This Positiv 20 can says that it can be dried at raised temperature of 70 degrees. Being impatient that is thus just what I did, using a light tight shoe box and an old oven. Whether it was the spray can being a 6 years old by now or the oven not very stable, the result didn't develop well or maybe not at all was a better qualification. 40 degrees seems safe but just waiting 24 hours is even better as the layer will be become more even. My lighting case is a home-built affair of a plywood box with clear glass sheet and on the bottom 2 UV tube lights that can be purchased at any postorder firm with electronics department. The sheet is put on the glass sheet pressed lightly with a piece of foam and kept by the lid. Required lighting time is about 4 minutes. Developing is by dumping the brass sheet into a caustic soda solution of ~7 g/L and agitate the solution with the sheet. Now this solution is like very strong soap solving all fats from your skin thus if you don't want to end up with very clean reddish fingers without any callus put on a set of latex gloves to protect your hands. The developing normally takes about half a minute after which the sheet can be rinsed in water. You can see the pattern developing in the solution if it is complete on both sides then rinse it under the tap. The etching tank is just a simple plastic affair of Japanese origin. About 25 x 20 x 4 cm containing effectively a liter etching fluid. This came complete with aquarium air pump, heater and thermometer. Of course the glass heater breaks in some unguarded moment thus this was replaced by a better quality thermostatic aquarium heater. As most fish don't like 50 degrees you have to modify the bi-metal control in this to reach this range. An underlay of 1 mm thickness at the adjustment screw was enough in my specimen. The sheet can be hold by the lid with the titanium wires coming with the set but a set of plastic washing pegs and elastic bands is easier. I used Seno etching solution which is I believe is sodium persulphate again purchased from the electronics shop. This is a clear and clean solution and much better than ferric chlorid that leaves horrible yellow stains, which cannot be removed. However compared to the stuff bought at a specialized etching firm the electronics shops comes out as terribly expensive. But a liter suffices for many etchings, the solution slowly turning blue. At 50 degrees the etching takes about 15 minutes using a fresh solution. Old worked solution can be neutralised with some caustic soda and delivered at the municipal waste depot. Provided you don't bring professional amounts in 10 l containers they won't charge you as the service is paid for already. All in all the whole process of printing and etching can be easily done in anevening. Researching and producing the drawing is definitely the most time consuming part of the work. Finescaling the wagon starts with taking out the steel plate from the tank and cutting off the buffers and couplings. Some of these tank ends are glued others can be prized loose easily. The steel plate can be replaced by a 2 mm brass strip of 10 mm width. Wheels can be exchanged for 2mm SA replacement axles. First take out the platform part of the etch, start folding with the steps from outward to inward. Use a sharp edge and a piece of metal scrap to get sharp folds. After that the ladder is folded 90 degrees with the platform and then the hand rails are folded with thin nosed pliers. The platform can be glued to the wagon base. Fold the buffer beam and barrier into a flat piece with the buffer base plates in opposite direction. Drill the 1 mm holes for the buffers and 0.7 mm for the coupling. Glue the barrier using the new buffers to keep it in the right place. Next step is the other buffer beam. Here is the DSM wagon which now compares a lot better to the original on the photo. The walkway needs more care as the railing is thin and easily damaged. Hold it in place with a magnet on a piece of steel and glue/solder the 4 keeper sections onto the base, there are left handed and right handed ones. This walkway is then attached with glue to the top of the tank using the ladder to line out the position. The ladder just clips over it and is not fixed to the walkway as some flexibility prevents damage. The lamp irons, hand rails and brake connection can be glued on after that. The photo shows that the original dome with a piece of the original base is too high, thus I replaced the entire tank dome and relief valve with brass turnings filling the oversized holes with carfiller.